The ginger root, or rhizome of Zingiber officinale, has been used for thousands of years as a natural remedy for common ailments, and is currently one of the most commonly consumed herbal condiments in the world, used primarily in Asian cuisine. Beyond its culinary applications, mainly as a flavoring agents, there are a myriad of medicinal uses of ginger, and one of the more popular ways to consume it is by drinking ginger tea. Thinly slice or grate fresh ginger, or roughly chop dried ginger. If using a teapot, the herb can be added loose, otherwise, use tea balls, infusers, or tea bags. For each cup of hot water, use approximately half a teaspoon of the dried root stock or four teaspoons of fresh ginger. Pour boiling water over the tea in the teapot of cup. Let steep for four to six minutes. Pour into cups (strain first if loose herbs were used) and add a sweetener if desired. Many people have found ginger to have a pungent taste that can be improved with honey, approximately one teaspoon or more. If you like, you can even add an ounce of brandy or your liquor of choice. When taking ginger, it is not recommended that adults consume more than four grams per day. Pregnant women should not consume more than one gram of ginger per day, and should always consult their doctors before use. Drinking ginger tea has many benefits, mostly due to its anti-inflammatory and antiemetic effects that are the result of the high concentration of gingerols and shogaols found in this herb. 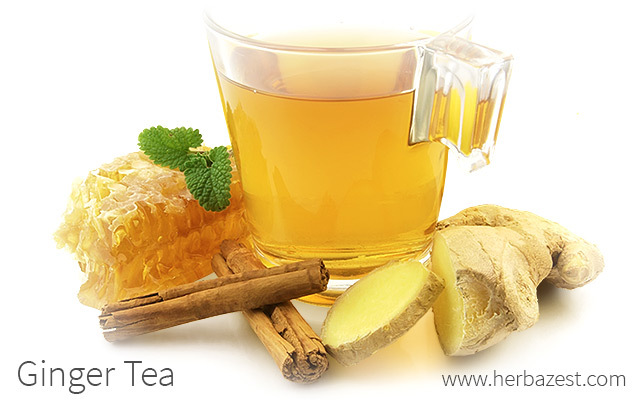 Perhaps the most popular and well-known use of ginger tea is for treating digestive ailments. The gingerols and shogaols help to neutralize stomach acids. In that way, the drinking of ginger tea has been found effective in easing motion sickness, nausea, and even morning sickness in pregnant women. Ginger tea benefits include anti-inflammatory effects, as it has long been reported that the root has the ability to decrease swelling and pain. For that reason, ginger tea can be taken to relieve the pain of headaches and migraines. It has also been found that drinking ginger tea can help adjust the menstrual cycle and provide relief from the symptoms of PMS. In fact, ginger's anti-inflammatory properties can decrease the pain of menstrual cramps. Ginger tea foot-baths can even be used by women who are looking to support healthy menstruation. When taken warm, a ginger infusion helps to cleanse the body's systems through perspiration. While not a strong antiviral, ginger tea's analgesic effects have also been found to ease sore throats. While drinking ginger tea is not the most potent method of reaping all the beneficial ginger effects, it can still provide effective relief to many common ailments.